As anyone who has been involved in the design and construction of a new home can attest, the process is a long and involved one, making the built end result that much more meaningful. So, when a project gets approved, permitted and moves into the Construction Phase, it's generally a pretty significant milestone. That said, MYD has multiple reasons to celebrate this holiday weekend, with two building permits pulled this past week for projects we've been working on for over the past year. When dealing with unusual or unique conditions, getting to this point can be even further complicated, and both these projects have had their own special circumstances, stemming from the primary component of... location, location, location. 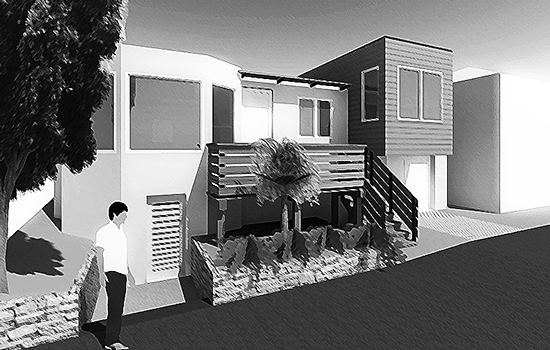 The first project heading into construction is a new single-family residence on the North Short of Oahu. The remote nature of the site requires a self-sustaining renewable energy source (PV panels with backup storage), as well as its own septic and water systems, making it completely off the grid. The site is also zoned as agricultural, requiring a percentage of the area to be dedicated to a crop production, which, not too surprisingly- given the climate conditions- will be coffee (ironically, a staple food group for architects). Given the significant differences in the application and architectural requirements, we've become well-versed in Honalulu's municipal code, with the help of a local architect in Oahu who has been a part of the support team, representing MYD and our client with regard to the various government authorities and local planning and building departments. In the near future, we'll outline that process in a dedicated post, but check back soon for the latest project images, information and drawings, as we are in the process of updating our website and online project portfolio. The second project to achieve the 'Building Permit Milestone' is a little closer to home, and its progress has been the result of many hours of design, collaboration, and extensive communications with the city, neighbors, and other various stakeholders, not to mention the commitment, input and admirable patience of our clients, who experienced first-hand the Design Review process, something truly unique to the City of Laguna Beach. Again, this process alone is a topic worthy of its own post, and perhaps that experience will be documented in the future as well, but what we will definitely share in the meanwhile will include more details of our own iterative process, intensified and expanded due to the particulars of the City's DR requirements. Best wishes for a great weekend and fantastic Fourth of July!